Wondering how to get your kids to clean their rooms? Is it really possible? 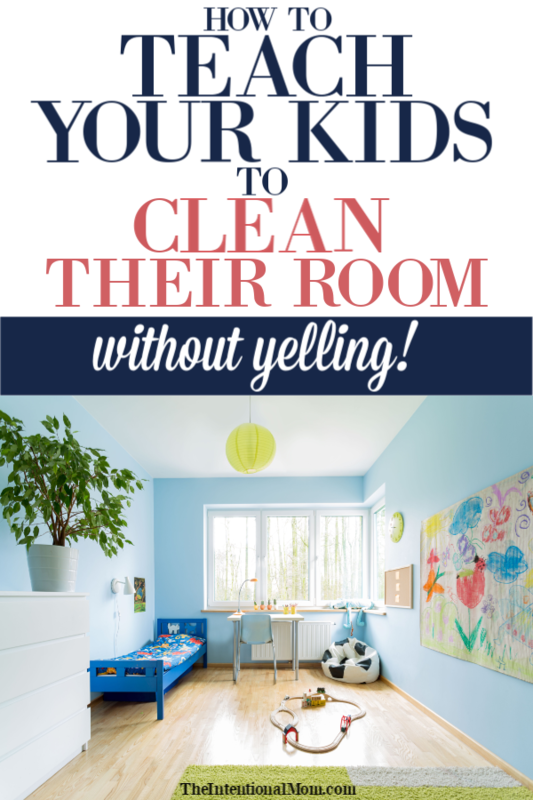 Wouldn’t it be nice to get your kids to clean their rooms without yelling? What about how to get your teenager to clean up after themselves? With four teens myself, I sometimes think getting my teens to clean their rooms is harder than getting my younger kids to clean their rooms! But, it’s all about having some surefire tricks to making the entire process easier and heading off problems before they can even start. I firmly believe as parents we should make our kids clean their room, but, you do have to teach them and equip them to get the job done. Looking for more on family cleaning? Make sure to grab our 10 Commandments for Cleaning With a Family by entering your email below. Grab the Printable 10 Commandments! Have these 10 commandments delivered right to your inbox! It really is possible for your kids to clean up after themselves, and this includes keeping their rooms clean. As a mom of 9, I am fully aware of the challenges moms can face in getting kids to clean up after themselves and to keep their rooms clean. But, read on, it can be done! Try these tricks for teaching your kids to clean their rooms. This means keeping the amount of “stuff” they have in their rooms to a reasonable and manageable amount. This amount is completely personal and also dependent on the size of the bedroom. You also have to take into account the availability of space in the other areas of the house for their things. It also depends on how many children are in the bedroom, and so much more. 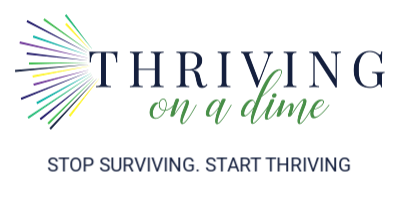 For me, I have up to five kids sharing one large bedroom, so we have had to really take this tip to heart. The amount of clutter in kids’ rooms is very minimal in our home. 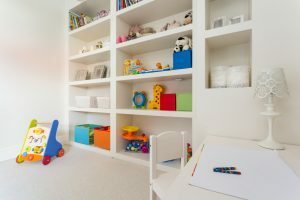 But in having kids with clean rooms, I cannot stress enough the importance of being reasonable in what is kept in your kids’ bedrooms and what is not. I know, I know. Life is busy. 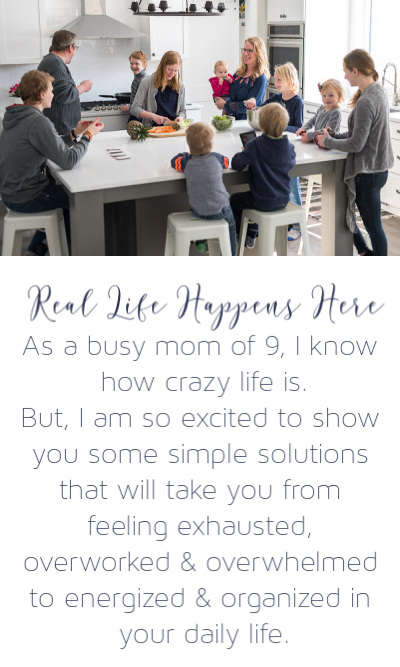 With nine kids who are home I day, a business to run, and kids who are in all kinds of activities I understand the busy lifestyle. But if you want your kids to keep their spaces clean, you have to keep your spaces clean as well. Does this mean perfect? Certainly not. But, just your kids seeing you work on keeping things clean throughout the day sets a good example even if you don’t have the time to clean things completely. I find it’s more about your kids seeing you put forth the effort rather than actually being perfect in keeping a clean home. Let’s get real, having a home that is always clean with kids around can’t really be possible, can it? You will need to show them more than once in order for them to learn what you expect and to master the art of doing it, especially if they are younger. I find it effective to start by showing, then clean up together, then supervise them cleaning, then leave your kids on their own to independently clean their room. This is an important step, but it is one that is rather annoying, if I’m being honest. I hate going in and inspecting work, but, it must be done. The final step in your kids cleaning their rooms is you making sure they have done it according to your standards and in a way that is acceptable to you. From a young age, teach your child to pick up after themselves before getting the next thing out. It is amazing how simple this concept is, but it is so hard to implement since kids can create a tornado in the two minutes that you are using the bathroom. Find a way that is acceptable for you to limit the amount of things they can get out to play with at one time. This way, it will be easier for your kids to put their things away. Put a lower bar in their closet using a tension rod to put their hanging things within their reach. This is generally an easy project, and it will make cleaning up their clothes so much easier. That way, it will be easy for your kids to see how full each container is and to quickly sort the containers properly if they get out of hand. This can be done either with words or with pictures of what is in each bin for kids who can’t yet read. I love this labeler HERE for labeling. 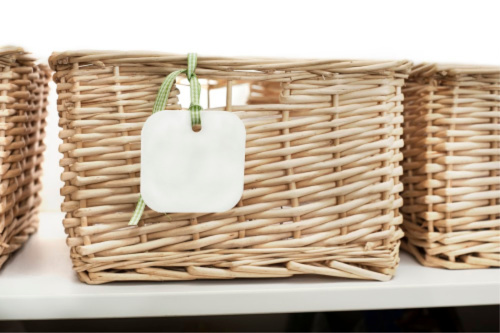 It’s totally worth the purchase since the things in your home will be beautifully labeled. This would include labeling their dresser drawers with words or a picture of what goes in each one. No matter their age, all kids can look at pictures and put things in the correct places. If your kids keep their clothes in their closet you can even get creative in finding a way to label where things go even in their closet. Smaller pieces of clothing can be a real issue to keep organized even for adults. Add smaller kids clothes into the equation and you can have a big mess real quick! 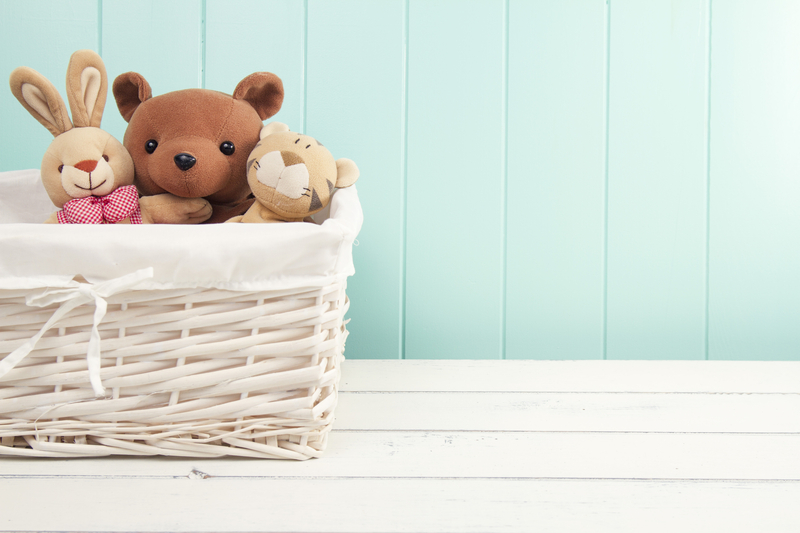 Use smaller containers in kids dresser drawers to keep things like socks, underwear, belts, and slippers together. There is nothing worse than the case of the missing sock, which happens all the time in our home! This is such a simple thing to do, and it makes a world of difference in your kids being able to maintain some sense of order inside drawers. This is an especially useful tip if your kids have large drawers. This may not be an option in quite the same way if drawers are smaller, but if your kids having trouble keeping their clothes cleaned up it could be because you haven’t found the right way for them to keep them neat. Keep trying different signs until you find a system that works! If you don’t have a dresser, this same concept can be used for storage inside of closets. 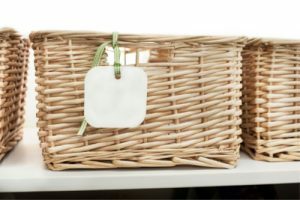 It is amazing what you can do with various sizes of baskets and bins inside kids’ closets. I love hooks for half dirty clothes, things like hats and hoodie sweatshirts that can be worn again. These can even work good for trowels or other things like necklaces, scarves, and more. 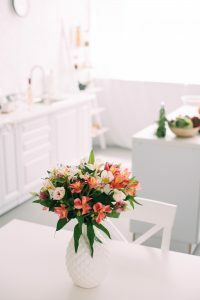 In addition this can be a really cute way of adding a pop of color or decorative touch to the room while also creating more room in precious drawer space. Let your kids be involved in the decision as to where to put their things. If they are a part of this process, they are more likely to want to put things away. Of course it needs to make sense, but getting their input is a great thing not only for kids self esteem, but also in helping them keep their things picked up. I’m not sure if it’s just my kids, but even though they are supposed to put their towel back in the bathroom after they use it, towels always seem to be in their bedroom. As hard as I try, even wet towels are often found in my kids’ rooms. Have a different colored towel and washcloth for each child so they can be responsible for taking care of their own towel and washcloth after using them. When the bathroom is a mess of towels or washcloths, you know just who to seek out based on the color. It makes it so much easier to hold your kids accountable. With nine kids, I could never keep it all straight otherwise. Get rid of excess packaging or packages that just don’t make sense or aren’t easy to use. Often these things are big and bulky, and in many cases this packaging is only designed for packaging purposes rather than for storage purposes. Have you read about my game and puzzle storage? There is so much wasted space in the boxes – and it makes stray pieces so much harder to put away. If you have not read those posts for games and puzzles, they just might transform the clutter in your home…and your life! My methods are a bit drastic when you first read about them, but they have been life-changing, especially with limited room for storage. Stuff rotation is toy rotation taken to the next level. Whether it is clothes, books, toys, or something entirely different, proactively making sure there isn’t too much to get cluttered in the first place is key. One easy way to avoid this is to rotate the things in kids bedrooms every couple of months. Just as I spoke of when I packed my kids’ things up, having less is often a welcome sight in many kids’ eyes. 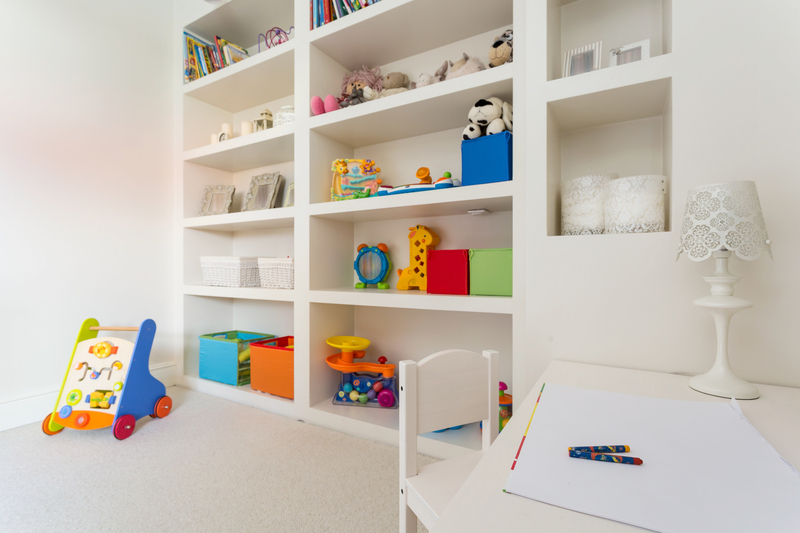 Schedule a 10 minute tidy three or four times each day, and make sure kids’ rooms are on that list at least twice. Are you not sure what a 10-minute tidy is? Read about my 10 minute tidy HERE. Keeping kids’ rooms clean hinges on keeping up on the mess before it starts. Any area in your home will remain cleaner when you clean it at least to a certain extent throughout the day. This is what makes the 10 minute tidy so valuable.